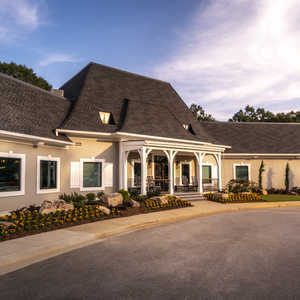 Chateau Elan Winery and Resort is a resort, spa and winery about an hour outside Atlanta. Chateau Elan boasts three public courses, two championship courses and a nine-hole course. The Woodlands Course is one of the public courses. It is considered the most scenic of the three championship layouts with stunning views of the north Georgia foothills and a landscape of sparkling lakes and towering trees. 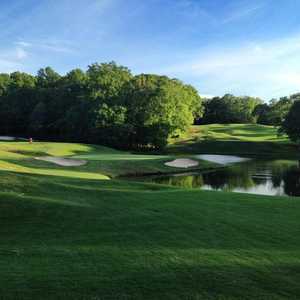 Although Chateau Elan Golf Club & Resort is just 40 minutes from Atlanta, the panoramic views of the north Georgia foothills make it feel much further from the city. The Chateau Course is one of the public championship golf courses. The layout wanders across 170 acres, winding around a lake and two creeks. BRASELTON, Ga. - Even though I had skimmed through the literature, it was still a bit of a shock to see a 16th-century-style French chateau surrounded by lush vineyards while I barreled down a Georgia interstate. After a week in the Atlanta traffic, it was good to take the off-ramp into France. Chateau Elan Winery and Resort is a working vineyard - the biggest supplier of premium wines in the state - as well as a spa and golf resort, and it appears to take all three seriously. There are three golf courses here, four if you count the cute little par-3 executive course. The Chateau course was the first to open, in 1989. At a touch over 7,000 yards, and designed by Atlanta architect Denis Griffiths, it is said to be an atypically difficult resort course. Chateau Elan's Woodlands course opened in 1996 to the public and resort guests. The Legends course at Chateau Elan, the unlikely collaboration of three disparate golfing personalities, was the last to open. Gene Sarazen, Sam Snead and Kathy Whitworth each picked six of their favorite holes from around the world. I played the Woodlands course in late March, which was only a tad unfortunate because the greens had been recently aerated. "I think it's a great course; it's just too bad we're playing it this time of year because the greens are a little bumpy," said Ed Wolpert of Orlando, playing with his friend Herb Sudfeld of Philadelphia. "I think it's a terrific course." True enough, on this late spring day in the north Georgia foothills, with color exploding all around, bumpy greens were only a minor irritation. The Woodlands is a very picturesque course with the sort of elevation you come to expect in Atlanta-area courses, maybe even a little more so. It starts off a little suspect, with homes lining the fairways like they're bragging about their size. "It's like a showcase for homes," Wolpert said. 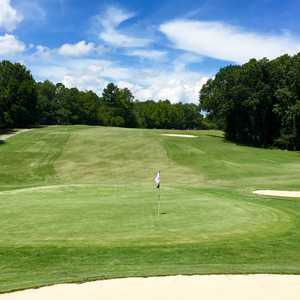 But, the development eases off after a while, and there are stretches of the course where it's just you, the rolling, tree-lined hills and the superb course. The fairways dip and fall, with flags flying down in lonesome valleys and up in the air. There are any number of holes that will stick with you afterward, like the opening par-5 and the 398-yard fourth hole, which tees off sharply downhill: If you hit it right here, you'll catch a serious roll and you can tell all your buddies about your 300-yard-plus drive. The greens are something else. Midsize to large, they are all sloped and undulating, with many being multitiered with distinctly different levels. They will definitely make you focus your approach shots to the right part of the green. Concentrate on the pin position sheet the starter gives you, because shots hit even to the middle of some greens, if not hit to the correct part of the green, will come back at you. It happened several times during this particular round. Green fees here are in the $50-80 range and include cart, yardage books and range balls. Dude, for this course, that is a very good deal. Here's a better one. The club, for the past six years, has allowed women to play free from Nov. 15 through March 31. The green fee is waived, and women need pay only the $20 cart fee. How about a little French countryside in the Deep South? Chateau Elan Winery and Resort is in Braselton, about an hour outside Atlanta, right off Interstate 85, but, as they say, a world away on 3,500 acres of rolling terrain. Chateau Elan is a resort and winery in the foothills of the North Georgia mountains. It reminded me of some of the resorts/wineries in which I stayed in the wine region of South Africa. It's pretty darn weird seeing a 16th-century-style French chateau surrounded by lush vineyards from an interstate in Georgia. But that's what it is, and the full-production winery is the largest maker of premium wines in Georgia. The inn has more than 250 rooms, 20 suites, 14 spa suites and golf villas. There is a 33,000-square-foot spa with 14 guest suites and 36 treatment rooms. There are impressive conference facilities. But the stars of the show here, aside from the golf courses, are the eight restaurants, from casual to serious eating. Menus range from classic French, contemporary international to Southern regional and traditional Irish at Paddy's Irish Pub. All the restaurants can be paired with premium wines from the expansive vineyards.